One of the many good things to come out of Northern Loops has been the connections we have made along the way to launching the all age knit groups. 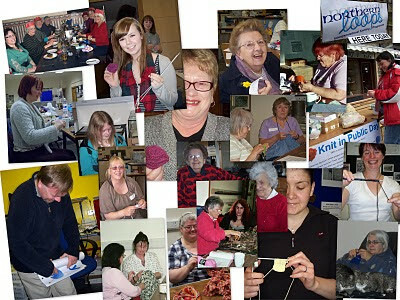 This is a post to say thanks to all those who took part and invite you to join us in 2011. First, thanks to NESTA, (National Endowment for Science, Technology and the Arts)whose Age Unlimited funding and encouragement took Northern Loops from a little idea to a full fledged project. Thanks to my fellow would-be social enterprisers: Poetry Net, Sing Away Snores, The Big Event, The Dragon's Tooth Thursday Club, The Hub Cafe, Third Age Computer Fun, and my friend of the Big Sing. I learned from your ideas and enthusiasm as an integral part of the NESTA journey (and continue to do so thanks to Michael's blog). Thanks to my Coach in a Box, which NESTA made possible. When I felt as if I were alone, I had a coach to help me find my groove and help me reach out to others for their help and support. Thanks to Owen Cook and Space Unlimited. When we ran up against the ideas that "young people" aren't interested or able to do things or that young people think of knitting as "boring, " Space Unlimited took up the challenge. They explored our concept and developed a survey and identified ways that would make the project more appealing to young people. Thanks to Rom Art for graphic work that helped us spread the word--brochures, banners, and a how to sheet put together with little input and less time. Thanks to United Reformed Church, Castlehill Heritage Centre, Caithness Horizons, and friend's kitchen tables and living rooms for hosting the groups and meetings and providing room for knitting. Thanks to Thurso high school for letting us take part in their classroom. Thanks to local Council for letting us give away flowers on the pedestrian precinct (and to everyone who helped or stopped by) and to the cafe who welcomed us there. Thanks to Project Linus for giving us a local project where knitting could make such a big difference in our community. Thanks to Caithness Voluntary Group for support and encouragement and connections and answers to questions I did not even know to ask. Thanks to those who donated wool and needles. Thanks to those who knit a flower, stood on the precinct giving away leaflets and flowers, stitched a square, brought a friend, invited us into the high school classroom, cast on needles, suggested where to get kid size needles, made coffee, set up a display, told me what a domain name was and how to buy one, helped me sort out receipts, drove all the way from Edinburgh, responded to my frantic emails for information, or even offered a kind word when it felt as if we were up against insurmountable odds. Thanks. Every smile, stitch, needle, word made a difference. Below is a collage of just a few of the people who were part of Northern Loops this year. We smiled gleefully into the camera yesterday at our luncheon and enjoyed laughing, talking, and talking about knitting, but the real stars of the term sat largely ignored in a large plastic box at the head of the table. Northern Loops teamed up with Project Linus to make blankets for the Caithness and Sutherland ambulance service. Today I tried arranging them to display the colours, the careful stitching, and the snowy backdrop symbolizing the comfort that we hope to give with our blankets. I perched my unfinished squares at the top both to say "I'm working on it" and to represent all the stitches and all the squares made by those who did a square or a bit of one and someone else picked it up and finished it off or tucked it away for finishing in front of the fire. Caithness has a reputation for looking after its own--in part because we have to and in part because we want to. These blankets are a part of that Caithness way of life. Nearly a year ago Northern Loops began as a good idea without even a name. NESTA (National Endowment for Science, Technology and the Arts) offered funding as part of their Age Unlimited program. Their goal was to find and encourage would-be social change agents in their 50s and 60s to help reduce social isolation for older people. A few fellow knitters and I filled out the application and the idea began. Along the way, it gained a name, a focus, and now we can wrap up the first term of charity knitting and look forward to the next steps--this blog is part of it, along with a proper web page, and in time a book of our own tips, tricks, and patterns. Seven of us braved the snowy, icy roads to get together at Castletown Hotel for what Olive called an end of term celebration. I am insanely amused by Christmas Crackers ("What do you call an American drawing?" --"A Yankee Doodle") and any excuse for chocolate is welcome. Although only 7 of us were able to attend, nonetheless folks from throughout the project were there. Angela and Margaret were part of the original application. Heather is part of the Edinburgh Three who went to Edinburgh to make the final pitch for funding. Olive was recruited from the pensioner lunch at Castletown Hotel and she has not slowed down since I first met her. It would embarrass her to single her out for too much attention, but let's just say that the majority of the blankets are hers.